I have been diagnosed as pre-diabetic. The doctor has not put me on any medication, but would like me to lose weight and watch my diet. I’m not sure how much or how often I should be exercising. Could you give me some tips? Wonderful! You are taking a huge, important step in improving your health, and in avoiding the many complications diabetes can cause when dealing with excess weight and a poor diet. Now is definitely the time to take action! First, you should check with your doctor before starting any intensive exercise. He can evaluate your current health, including your cardiovascular status, to determine what is safe for you. If you are given the OK by your doctor, you can get started! The important thing to remember is not to over-do in the very beginning. If you start too hard, you put yourself at risk of injury, excessive fatigue, and discouragement, making it very hard to want to continue your new habit. According to the American College of Sports Medicine, adults 65 and younger should do moderately intense activity for 30 minutes a day, 5 times a week, or vigorously intense cardio for 20 minutes 3 times a week to maintain weight and to reduce your risk of disease. 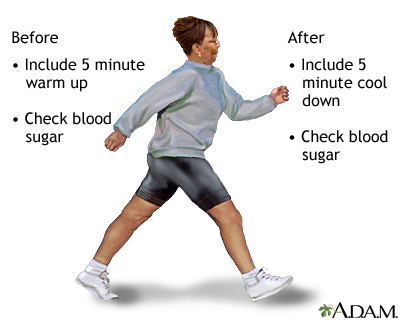 If you want to lose weight, the time spent increases to 60-90 minutes of moderately intense activity. They also recommend 8 to 10 strength training exercises with 8-12 repetitions of each twice a week. Just keep in mind that with eating a healthy diet and physical activity go hand-in hand. It is extremely difficult to succeed at weight loss without the other. You can do it! !